The Harley-Davidson FLSTS is a motorcycle produced by Harley-Davidson in 2003. The Harley-Davidson FLSTS is commonly known as the Heritage Springer Softail. 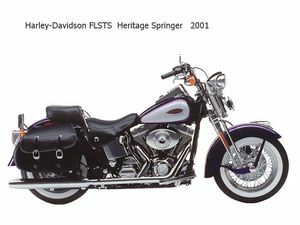 Introduced in 1997, the Harley-Davidson FLSTS Heritage Springer -- known as the "Old Boy". Came only in white. The striping was red or blue, and a 1940s-style emblem graced the tank. Came in a vivid black. Again, the striping was red or blue, and a 1940s-style emblem graced the tank. This page was last edited on 25 August 2010, at 16:49.